Find My Workspace lists over 95% of the business centres market in Swanley. Simply click Request Quote to check pricing for one office, or Add to Basket for multiple offices. There are two, 1st floor, fully serviced offices for rent totaling 720 sq. ft. (360 sq.ft. each). 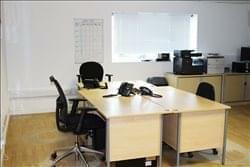 They are located in a modern prominent light industrial unit at the entrance to gated estate in established location. Each office has room for six or seven desks. Separately they have access to a shared reception area, with kitchen and WC, and storage space can be made available within in the warehouse. Rented as a unit, the tenant will have ownership of the reception area and additional warehouse space. There is also allocated parking and loading to the front of the unit. Within the estate is a café, serving breakfast & lunch and a convenient car mechanics.